A big question for both newbie and seasoned surfers and stand up paddle boarders (SUPers) is in fin selection and setup. Fins are made of various different materials, with each offering pros and cons for different applications. Various anatomical factors must also be considered. 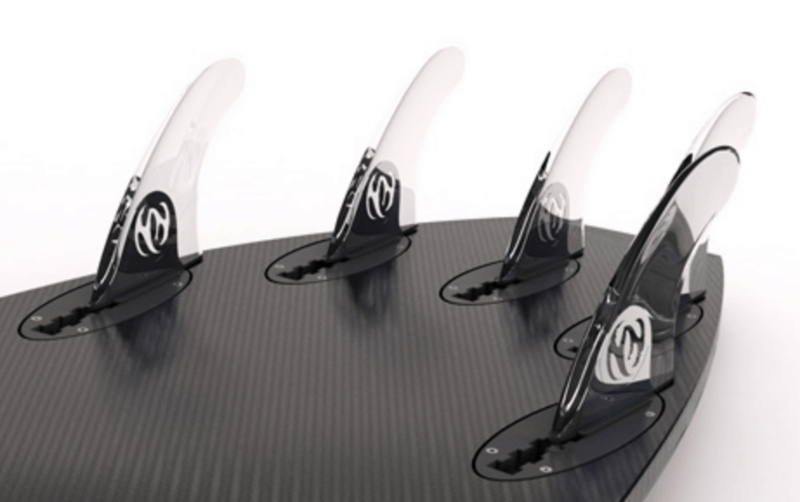 And, finally, there’s the multitude of ways in which surfers and SUPers can set up their selected fins for optimal performance based on their desire for drive and speed, control, agility and turning radius, tracking, and stability. There’s a lot more involved than sticking a fin on a board and hauling waves. 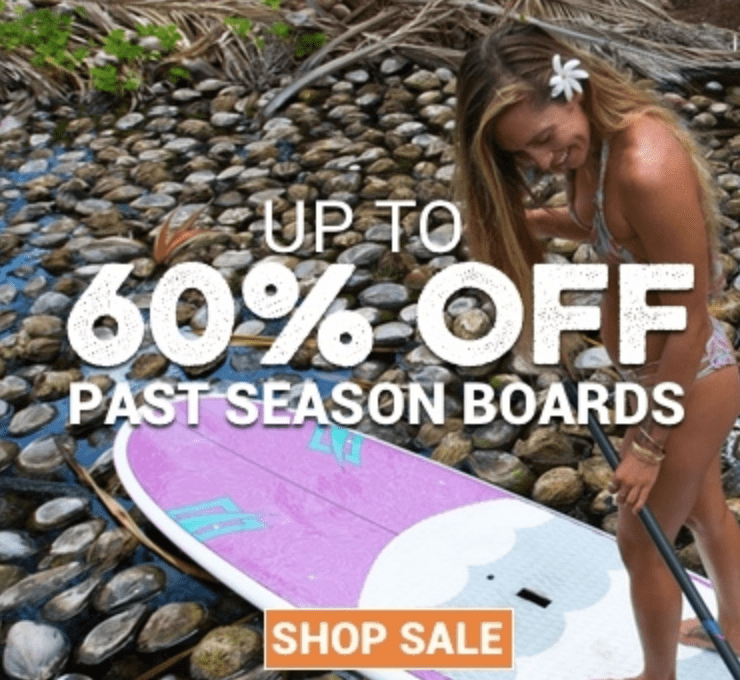 Having the right set of fins in the right places will enable will help you maximize your paddle boards performance and allow you to just have an all around better learning and/or pleasurable experience in the waves. Here is your total guide to choosing the best fins and best setups for unique environment and style. There aren’t bad and good fins. Selection is more an issue of the different materials holding their own distinct properties that give them different edges in performance, response, flex, stability, drive, and even longevity. Once upon a time, surfers and SUPers had to pick plastic, FG, or CF, which really limited them in versatility and cornered them on style. 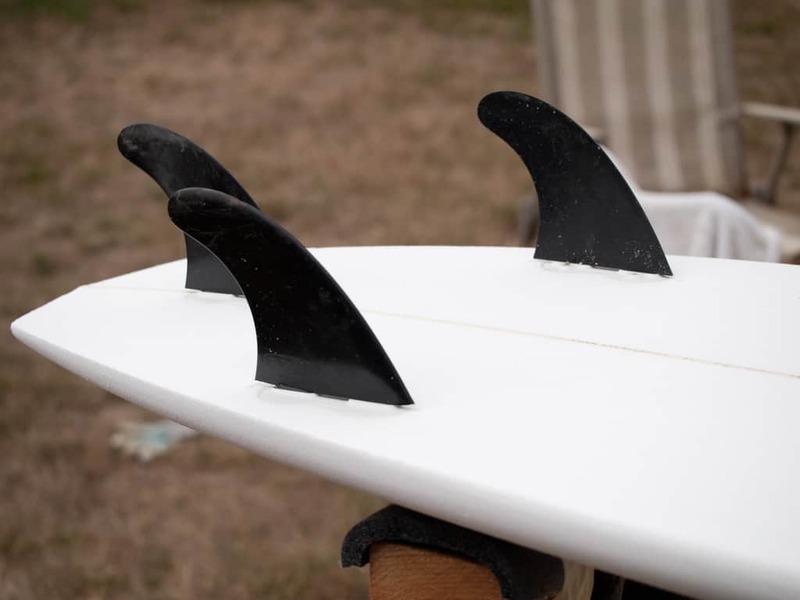 Today, manufacturers have taken the best of both worlds in combining carbon fiber (CF) with fiberglass (FG) to make fins with stiffer or more flexible bases verses tips. A relatively new combo is for the core of the fin to be honeycomb and the tip and base CF, such as the Futures Techflex design. 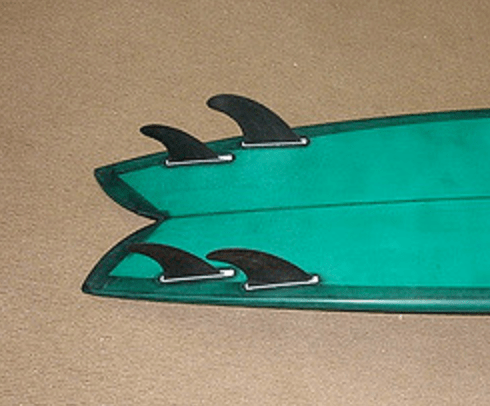 Some boards come with a free set of fins. It’s likely that free set is plastic. Plastic fins are the cheapest option, which makes them easily replaced, but also lacking when it comes to certain areas. Predictability, reaction times, speed, and overall performance are low. Stability is moderate. Flex is high. Whether it’s solid fiberglass or a fiberglass and fiber carbon tip combo, these are all very high performance fins. Flex is low, making a stiff fin, and they’re almost indistinguishable between the combos. This is good for hold and drive needed for monster waves and powerful surfers. It’s not so great for smaller surf where flex is needed to generate speed. An FG base/CF tip ranks slightly lower than solid fiberglass and CF base/FG tip when it comes to stability, drive, performance, and responsiveness, but all three are very high caliber options overall. The heaviness of the fin is perhaps the drawback most SUPers and surfers find least appealing. This option gives you a little more flex and a little less weight than solid fiberglass fins and the FG/CF combos, which does allow the speed needed in smaller surf environments. The Futures Techflex example from above uses a honeycomb center with a CF tip and base. This gives the fin a controlled flex, stiffness similar to solid fiberglass, but minus the added weight. Win and win. When it comes to overall function and performance, carbon fiber and fiberglass are virtually impossible to distinguish between. They just perform very similarly across the board. It is, however, a bit lighter and less flexing than solid fiberglass. Most surfers and SUPers find that the main con is how costly the fin is compared to how often they end up having to replace them. CF is quite brittle material and subject to break upon impact with reefs or even careless handling. It’s mainly a cost consideration. 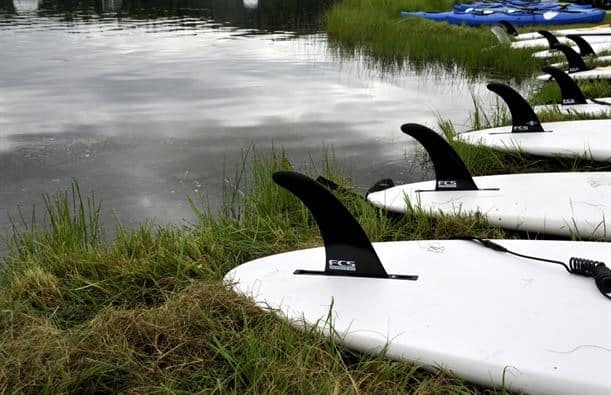 How much or little surface area a fin has is perhaps the single most important factor to consider in selecting the right fin for the right rider. While measurements can vary from country to country, the U.S. uses square inches to measure fins. Each fin has a base, height, rake, and foil. The total surface area of a fin dictates the control, hold, and drag it yields. The smaller the surface area, the less control, hold and drag yielded; the larger the surface area, the more control hold and drag yielded. Regardless of brand, always select the size of the fin based on the rider’s weight. The heavier the rider, the larger the fin must be in order to sufficiently grip the water. Consider performance in selecting the size of the fin. The smaller the fin, the less hold the fin has in the wave and the more loose and sliding the board will be on the water. The fin base is the horizontal distance from where the side of the fin touches the front of the board to the back of the board. This distance, or the size of the base of the fin, is what controls drive. It determines facets like how much speed is generated from pumping down the face and turns. Shorter bases give you less drive and tracking and more looseness. Longer bases give you more drive, stiffness, and tracking. This can be a delicate compromise for surfers and SUPers. Wider bases are harder to initiate a turn to pivot up the face without the board projecting forward on them. While a narrow base pivots great, it’s just makes it more strenuous to get speed up while pumping. This is the vertical distance of the fin from its base attached to the surfboard to its tip in the air. The height of the fin is the predominant stability factor. The shorter the height, the less stability and hold. The taller the the height, the more stability and hold. Taller fins protrude deeper into the water, stabilizing the board to lessen tipping. The degree of stability also affects the control and hold in the tail. SUPers generally prefer shorter fins because the taller ones create so much drag in flat water. This is the degree of curvature from the base to tip of the fin. Curvature also affects the stability of the board as it accelerates. One of the main roles is in the turning arc of the board. Lower rakes mean a more vertical fin and this results in lower turning arcs, pivot, tip flexing, and kelp shedding. Higher rakes involve more curvature and result in better turning arc, more pivot ability, more tip flexibility, and better kelp shredding. So, high rakes allow for more curved and drawn out turns on huge rails and greater stability during speed. Less rake offers tighter radius turns and snaps. From the front, look at the fin’s edge. It looks like an airplane wing, right? That’s because it works in a similar fashion. The foil is what generates lift that raises the board out of the water and allows the rider to generate speed. The thinner a center fin foil is, the more speed, less stability, and less drag it will produce. The thicker a center fin foil is, the more drag and more control it will produce. Flat side fin foils are designed for control. Curved side fin foils are designed to help generate speed. Powerful surf conditions may favor an inside flat foil to control speed verses generate it. Whereas, smaller waves may favor a thinner foil to minimize drag and aid speed. There are endless possibilities when it comes to arranging fins on a board. Each combination, or lack there of, has its own advantages and disadvantages for speed and drive, control, radius, tracking, and stability based on the characteristics the fin or fins collectively produce. Play around with the possibilities to see which works best for your environment and style. 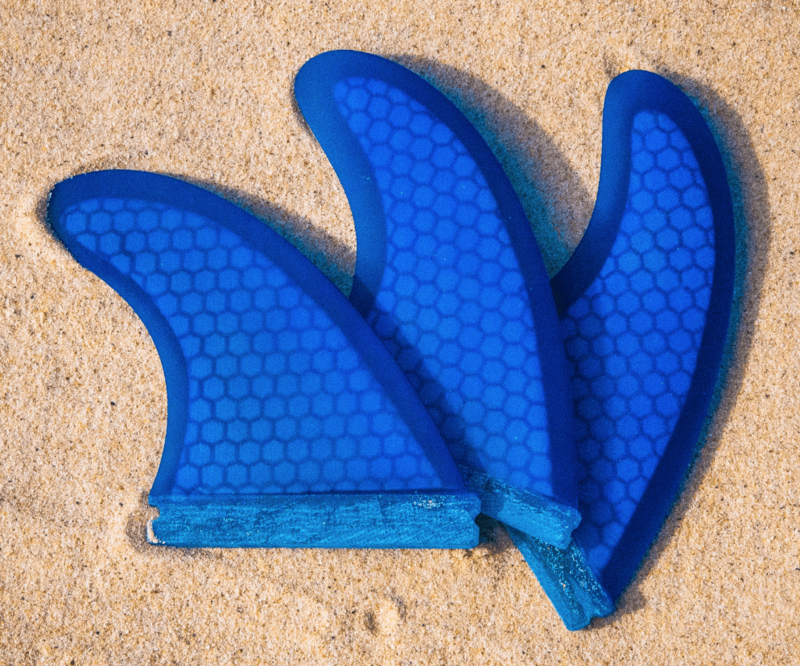 Here are some points to consider in deciding how to set up fins. Single fins for racing SUPs and surf are great for nose riding and classic surf styles. Paddle boarders often have a single fin setup during races to eliminate unnecessary drag, but still maintain high stability and moderate control. Where single fins perform the poorest is in turning radius. Single fin is also most common on a Yoga Paddle board setup. Twin fins offer even greater speed in surf. They yield high turning radius, but take a nose dive when it comes to stability, control, and tracking. They just can’t offer a lot of hold in bigger surfs to cut down on squirreling. 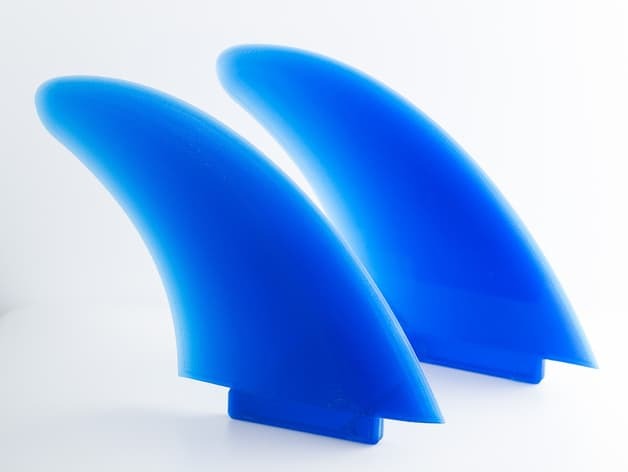 Thruster sets, which can be either 3 equally sized fins or a large center fin combined with two small side fins, is often consider the middle ground between single and twin fins. This option has a low turning radius, but performs moderately in tracking and high in speed, control, and stability. Basically, the side fins offer quick turns while the center fin offers stability. Quad setups offer more speed and turning radius than the thruster and single setups and more control than the twin setup. Stability is similar to twin setups. Riders will get about the same control as a single, which is far less than thruster setups, but is a slight advantage over the twin. It can leave the rider loose in the pocket. Overall a great option to keep speed without sacrificing hold. Five fin setups aren’t widely used. The main reason is that it provides maximum control and great stability, but at the expense of sacrificing speed and tracking and offering almost no turning radius. There’s added drag without much benefit. Speed can be corrected somewhat with a knubster, but the other drawbacks are still usually too great to see this setup used very often by anyone other than surfers looking solely for maximum control at all costs. To really get the best paddle board experience, follow what you have learned and test out what you like. Play around with different setups for different conditions and tailor your board to your own liking. In the end, all fin setups will work, just maybe not as well as one that was honed to your specific liking.